This is a basic no-fail quiche recipe that everyone in our family just loves. The meat, cheese and veggies can be varied to whatever you desire at the time. Yum! Fry turkey sausage. Sprinkle into pie crust. Top with onion and then with cheese. In a separate bowl, beat eggs, mustard, and salt. Add cream and beat. Pour over all in pie crust. Bake in a 425 degree oven for 15 minutes. Then reduce temperature to 300 degrees and bake 30 minutes more or until knife comes out clean when inserted in center. Let stand 10 minutes before cutting. Variation: Vegetables of your choice can also be added such as spinach, kale, broccoli, tomatoes, eggplant or zucchini. Serves 4-6. Mix thoroughly and fry. (Best if mixed and let set in fridge for at least an hour before frying.) Use half of the sausage for the quiche and save the rest for another use. 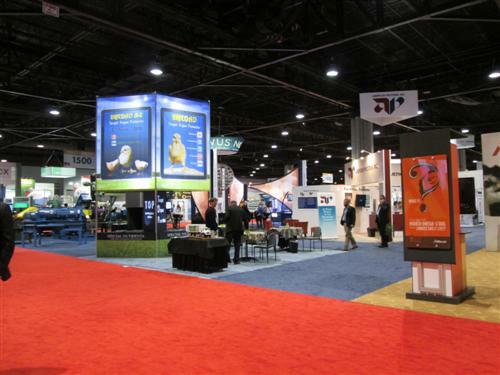 In January, Cathy and I (Myron) attended the International Poultry Expo in Atlanta, Georgia. It was a huge event with 28,000 attendees from all around the world. The Poultry Expo was located in two very large buildings and it took us an entire day to look at the exhibits in each building. Most of the expo was geared to the big poultry growers and processors, but not all of it. For us it was a very profitable trip. We were able to find some good products and suppliers as well as other helpful information to be able to provide you with even better eggs and chicken. After we left to return to our motel, our first day at the Expo, we got caught in the snow storm that paralyzed Atlanta. Fortunately, our side of the highway was not blocked and we were able to make it back to the motel. At 9:00 pm there were still 99 school buses stuck in traffic. Some school children spent the entire night on their school buses! The second day we were not able to attend the Expo because the highway was still blocked with tractor trailers. 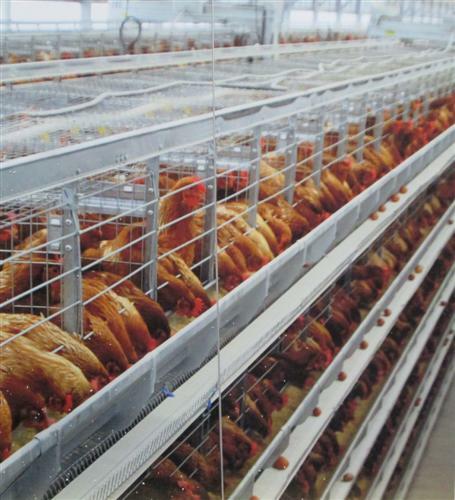 This is a cage system for laying hens. Each cage is divided into about 4 cages which hold about 4 or 5 hens. This cage system is only four levels high. 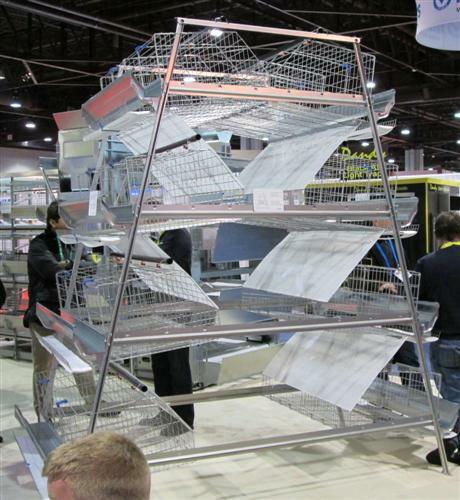 This was a picture at the Expo showing the cage layer system with hens in it. It is how most grocery store, restaurant, and fast food eggs are produced. These cages are stacked five high. Each cage is only wide enough for 4 hens to be side by side. This is the way most hens live their entire life and shows part of the reason why we feel it is so important to provide our hens with a better living environment. As I look at this picture some of the descriptions that come to my mind are: “jail birds”, prison labor, and mechanical egg laying machines, as well as inhumane, heartless, and greedy. The organic and pasture based farming movements are making an impact on society, and the big pharmaceutical companies are getting concerned. 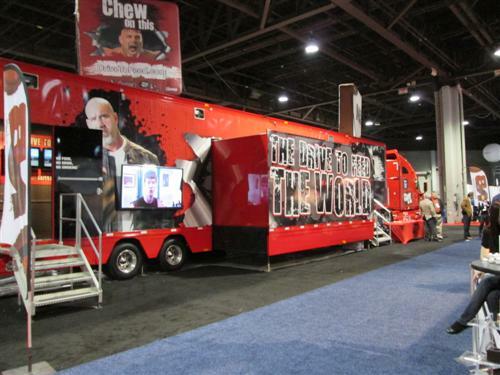 Two large poultry and animal pharmaceutical supply companies have launched a campaign to combat our influence with this fancy, expensive tractor trailer rig that they had at the Expo. Inside is a theater where they show movies knocking organic and pasture based farming, claiming that in order to feed the world we must use large confinement animal facilities (and of course their drugs and antibiotics). Read the egg label carefully. It is not misspelled. We saw these eggs at a booth promoting pasteurizing eggs (similar to pasteurizing milk). Egg companies know that consumers want eggs that come from chickens on grass, not from chickens stuffed in small cages. 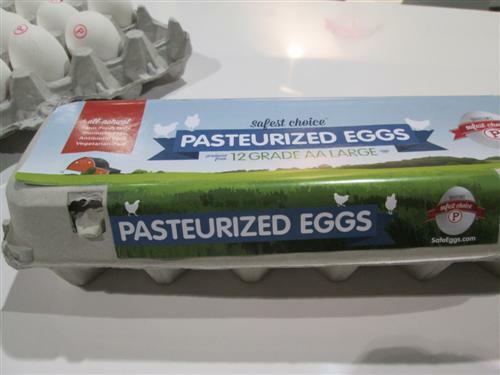 They often design their egg cartons, like this one, in a deceptive way to give the impression that their chickens are happy hens that roam in the outdoors on grass. Have you ever noticed how popular stuffed eggs are at picnics? It seems they are often all eaten. They are a wonderful way to eat eggs. For the best tasting stuffed eggs you need to begin with eggs that have been raised right; eggs that taste wonderful because of the wonderful grass and nutritious feed the hens ate. Of course, fresh eggs are the best. But you may have noticed that fresh eggs don’t typically peel well. There is an easy remedy for this. If the eggs are less than 2 weeks old, bring the water in your kettle to a boil before you put the eggs into the kettle. When the water is boiling, add the eggs with a slotted spoon into the cooking pot and bring the water to a boil again. Then immediately turn the burner down as low as possible and cook the eggs for 10 minutes. As soon as your 10 minute timer goes off, let the coldest tap water run into the kettle until the eggs are cooled. If you don’t want the water to run that long, run the water for a little and then add ice to cool down the eggs quickly. This also helps to avoid making the eggs in which the outside of the yolks turn gray. There is nothing wrong with an egg like that, but it doesn’t look as appetizing. When the eggs are cooled, peel them and cut each egg in half lengthwise. Carefully pop the yolks into a pie plate or other flat dish. Use a potato masher or fork to mash the yolks. Now for the great taste I’m going to give some general instructions rather than exact measurements. It is the cook’s prerogative to taste the food to make sure it is just how you want it. Add some mayonnaise and a little mustard; enough to make the mashed yolks creamy instead of dry. Add a little onion powder or maybe a little minced onion. Sprinkle on a little salt if it needs it. Stuffed eggs are also wonderful with a little dill weed in the yolks or some curry powder. Be creative and add whatever spices you think you’d like. Just remember that you can always add more, but you can’t take out spices so start with a little. I like plenty of yolk mixture in my stuffed eggs so I always get rid of a few misshapen egg whites. Fill the egg whites with the yolk mixture so that it is mounded a little over the egg white shell and so that you can’t tell which end of the egg white the yolk was. When the eggs are all stuffed, you can sprinkle some dill or paprika or some other spice on top of the eggs if you so desire. Cathy recently wrote a blog post for the Pantry Paratus website that you might find interesting on homeschooling on the farm. When I fry eggs I usually fry them on one side and then flip them over and fry the other side. This method is usually recommended so that the eggs are completely cooked. Restaurants are not allowed to sell sunny side up eggs because of the chance that they will not be cooked enough to kill bacteria. Myron wanted some sunny side up eggs like he had when he was a boy, but I always hesitated at the problem of getting them over fried on the underside and not done enough on top. Recently I remembered seeing my mother put a little water in the pan with the eggs and then putting on the lid. I decided to try it. It did the trick. The eggs weren’t overdone but still cooked through the way he likes them. After 25 years of marriage and cooking, I am still learning some pretty basic new things. Crack the eggs into your skillet. Fry them on the underside with a little butter. When the eggs are ready to be flipped, instead pour several tablespoons of water into the pan and cover it immediately. Cook them till they’re done as much as you like them.